A FOR Ranger program was presented on Jan. 16th to four West Columbia Elementary School fifth grade science classes taught by Phyllis Cappell. This educational program is designed for students of schools located in the San Bernard River watershed to raise their awareness and inspire environmental stewardship of the river. The three-part program consists of a watershed discussion, San Bernard River fish identification and nautical knot tying. 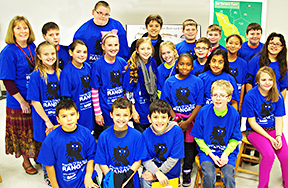 Each student received a packet of watershed information and a Ranger t-shirt with the Ranger raccoon mascot on the front. Four lucky students, whose names were pulled during a drawing, won a new rod and reel. More photos.